Last week, we watched Rich Franklin slowly dominate Evan Tanner en route to winning the UFC Middleweight Championship on July 4, 2005. 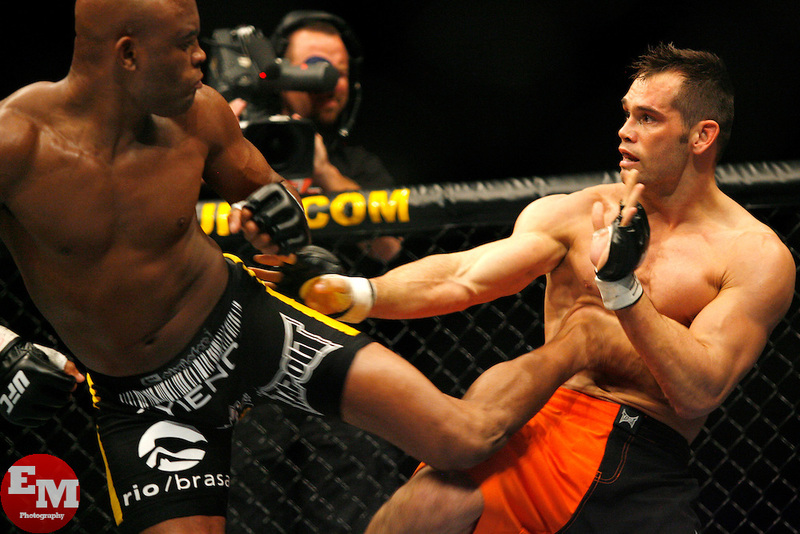 This week, we will fast forward to UFC 77 in October, 2007 for Rich Franklin vs Anderson Silva Part Two. One year and one week prior, Franklin lost his Middleweight Title in devastating fashion to Anderson Silva at UFC 64, losing by Knee KO at just 2:59 of the first round in Vegas (see video below). After nearly five months off, Franklin came back to defeat Canadian Jason Macdonald via TKO (corner stoppage) in his home state (Columbus to be specific), then improved to 24-2 in Belfast, Northern Ireland with a Unanimous Decision victory over Yushin Okami. Attempting to right his only wrong since joining the UFC, Franklin accepted the task of a rematch to get his belt back, this time in front of his home town at UFC 77: Hostile Territory in Cincinnati, Ohio. Silva on the other hand was just beginning his historic rise to the top. On a five-fight win (and finish) streak, Anderson had: KO’d Tony Fryklund (elbow), KO’d the zombie that is Chris Leben (knee), KO’d Rich Franklin (knee), triangle’d Travis Lutter and TKO’d Nate Marquardt with punches. Only Lutter was able to make it into the second round. This fight was part of The Spider’s 17 victories in-a-row and 10-title defenses in-a-row. UFC 77 was filled with names of yesteryear, including Alan Belcher and Tim Sylvia to name a couple. If we’re still counting Anderson as an active fighter, he and Demian Maia are the only names from that card still on the UFC roster. “The crowd is deafening” Joe Rogan (with hair) remarks as Franklin came to the octagon. With his armed outstretched to connect with fans, you could see the magnitude of the fight on Ace’s face. He didn’t look scared but you could tell he knew he had to be perfect if he was going to win. With his Cincinnati Bengals orange & black coloured shorts, Rich comes out and lands a couple slaps as both fighters feel each other out in the first minute. As if to say “don’t touch my face” or “You’re too close” Silva goes for the plum clinch, but Franklin seems to have learned something. Spinning around for a bit, it seems Silva’s clinch is just too strong as they go up against the cage. Rich manages to fight it off though, landing on top, on the ground. He’s never able to secure control however, as Silva dances to his feet on just one leg with Franklin holding the other, then pressing the Champion up against the fence after he’s unable to obtain a single-leg take down. After breaking away, Silva lands a devastating spinning body kick to Franklin’s midsection. The former-champ soon responds as Rogan mentions he has some unorthodox strikes, landing a looping right on Anderson’s head. With just under a minute left Franklin is cut above his left eye. Just after Franklin lands a nice left hand, it seems Silva has him figured out. He starts his trademarked dancing/dodging, and begins to overwhelm Franklin. Rocking him, Rich holds on for dear life before Silva crumples him with a right hand on the button to steal the round at the bell. What could have been a 10-9 for Ace, quickly became a 10-9 for Silva within a span of the last 20 seconds. Franklin needed help from Matt Hume to get to his corner. With his corner slapping and using physical cues to tell him what he has to do, Rich simply replies with “ok”. Franklin starts to “bring it again” as Goldie puts it, but it’s clear he doesn’t have the might on his punches as he did in the first round, Silva either absorbs them or easily blocks. A knee and punch drop Rich again, but he gets back up, only to eat more punches. He does exactly what his corner tried to tell him not to do, that is turn away from Silva. The Champ storms on with a flurry of knees, finally dropping Franklin for good. Official Decision: Silva by TKO (knees) 1:07 of the 2nd round. 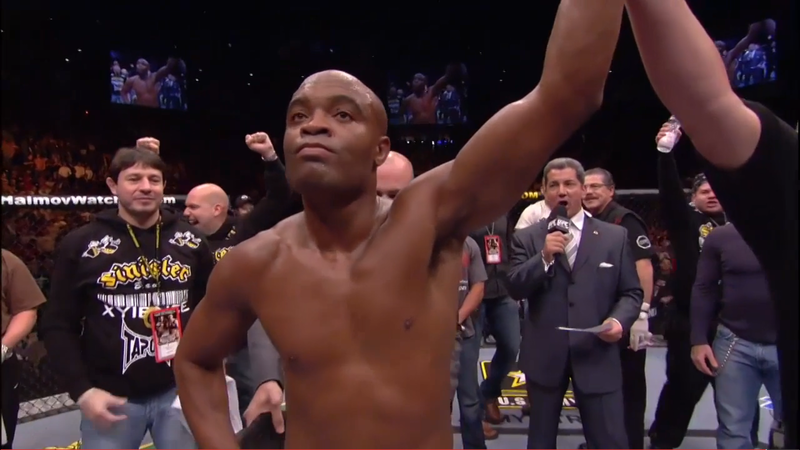 Anderson ‘The Spider’ Silva moves on and we will see him next week.